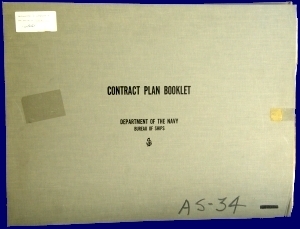 Thanks to shipmate Robert Mutnansky (DP3 - 1966-1967 - XD Division) the Association now has full set of ship blueprints. You will be able to re-visit all your working and berthing compartments. Enjoy your virtual tour of our ship! Super Canopus supporter, Tom Denton (ETC SS/SW - 1987-1991 - W-6 Weapons), has previously allowed free use of his Canopus watercolor print and provided a copy of his photo album to our Photos page. Now he has donated an amazing 72 sheet Contract Plan Booklet to the Association. Besides being able to see your working compartment layout, enter the Security Locker and walk past the Marine guard to see all those secret places in RC and Weapons without causing a security violation! Of special interest is No. 10, showing missile, torpedo, and periscope handling with subs and TAK alongside! So much so, the original blueprint had the broken lines and lettering redrawn and reproduced as a free handout at the 2010 reunion. Third Deck, Fourth Deck & First Platform General Arrgt.